Goal setting is essential in and out of sports. A 1979 Harvard study illuminated this by tracking the success of students who set goals and who did not. The result? The 13% of students who DID set goals ended up making TWICE as much money as the 87% who did not. We see this pattern play out in all kinds of fields. Goal setting isn’t just good for sports or business, it is for success in general. The goal setting process helps your children understand where they currently are, and where they are trying to go in their athletic efforts. Without goals, they can end up lost and unsure of what to do. When the game is on the line, players who have goals can calmly look to them to know what to do, while players without them may hesitate under the pressure. Players who do not set goals often fail to build confidence. One of the keys to building confidence is step-by-step goal setting. Kids can meet and exceed their goals while setting new ones, forming the building blocks of confidence. Goal setting will also make hard work and improvements more efficient, and the results will follow. At the same time, you do not want to set the wrong goals for your children. Choosing goals that are too ambitious can have the opposite of the intended effect; it can hurt kids’ confidence. If kids set their expectations to score three goals a game, they will never build confidence when they score just one. To set solid goals, first take a look at where you want to set the expectations for your children. Then set goals in the immediate, short term, medium term, and long term. The immediate and short-term goal successes will help kids boost confidence in the short term. Focus on the processes within the game and not the game as a whole when setting goals, to help your children focus on being in the moment while playing. Make sure kids understand that they strive for goals and they are not expectations they must meet. Goals can be assessed and re-evaluated often. At Kids’ Sports Psychology, we have a section for members on goal setting. You can learn how to teach young athletes how to set appropriate and positive goals. 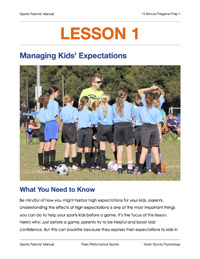 Download an eBook on goal setting at Kids’ Sports Psychology. 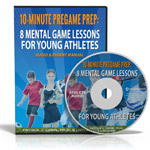 Learn Mental Game Lessons to Help Young Athletes With Their Pregame Prep! With our program, you can stop wondering what to do and relax before your kids’ games! Learn more about “10-Minute Pregame Prep”…. Don’t forget to get your FREE download (located in the middle of the page) of Lesson 1 from the Parent’s Manual! 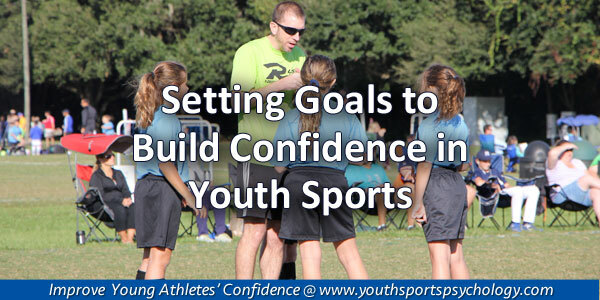 Help Young Athletes Boost Confidence in Sports! Criticize themselves often after making mistakes? Freeze up and look scared when faced with competitive pressure? Lose confidence after working with a negative coach? Perform like stars in practice but freeze up or play tentatively during games or competitions? If so, check out The Ultimate Sports Parent! The Ultimate Sports Parent will teach you powerful mental toughness secrets to improve your child’s success in sports. Get proven strategies form leading youth sports experts! What are sports parents saying about our mental training program?